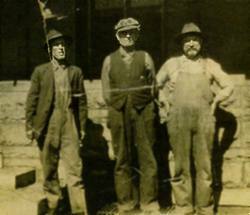 Jacob B. Vanderheiden is seated on the right. This is a picture of four of the sons of Lambert and Mary (Vinkenvleugel) Van der Heyden and their wives. Left to right: Joseph H.and Teresa O'Tool; John William and Theresa Helen Ricke; Henry D. and Ellen Whittle; and Jacob B. 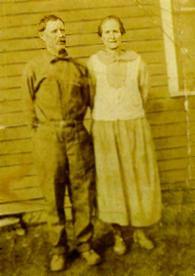 The picture was taken at Carroll, Iowa at an unknown date, possibly before Jacob was married. 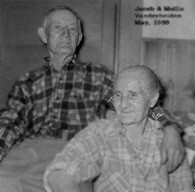 Jacob and Mollie (Mondier) Vanderheiden. This picture was taken around 1900. This picture of Jake and Mollie is dated May 1956. Jacob and Mollie and five of their seven children: Anna Mae (Vanderheiden) Thomas, Macon, Bonnie (Vanderheiden) Gober, H. S. "Blackie" and Virgil. 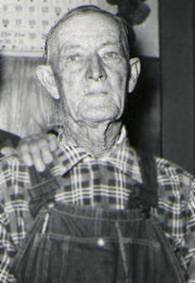 This picture was taken in the late 1940s or early 1950s. Jacob with his brothers John and Joseph Vanderheiden. They are at the Carroll, Iowa depot. 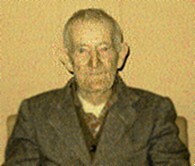 They were sons of Lambert and Maria Magdalena (Vinkenvleugel) Vanderheiden.